A crowd that filled this hotel’s main ballroom Sunday evening celebrated engineering, honored several American icons, and listened to an intriguing story of teamwork, perseverance, and ingenuity told by a living hero. 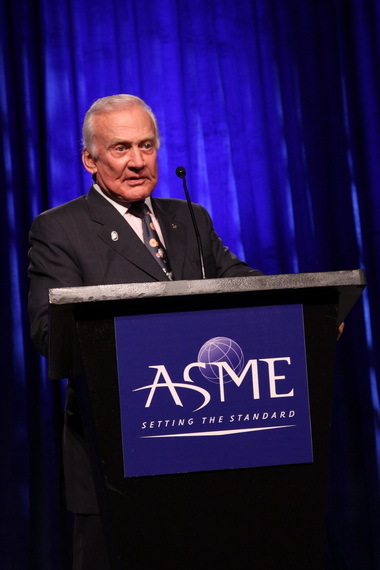 On hand to celebrate with ASME were Dr. Buzz Aldrin, the second man to set foot on the moon, and T.K. Mattingly, an astronaut originally scheduled to fly on Apollo 13 but who instead played a pivotal role in safely returning the mission’s astronauts to Earth. 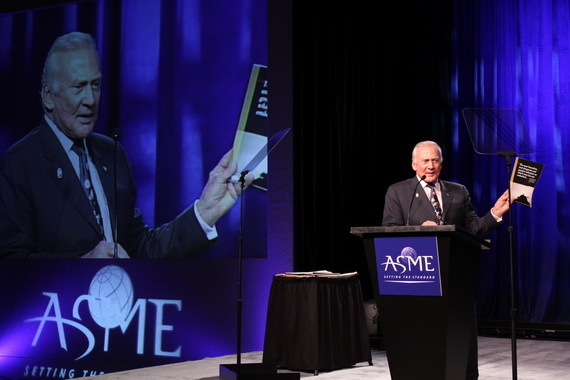 In recognition of the 40th anniversary of Apollo 11, ASME President Amos Holt and Immediate Past President Thomas Barlow presented one of ASME’s most prestigious prizes, the ASME President’s Award, to the crew of Apollo 11, Neil Armstrong, Buzz Aldrin, and Michael Collins. In accepting his award, Aldrin stirred the crowd by his presence and his words. His remarks emphasized the importance of engineering and teamwork. 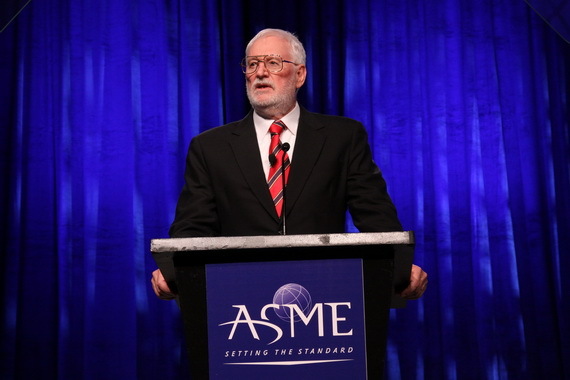 He said the Apollo 11 mission succeeded only because of the commitment to cooperation exhibited by countless engineers behind the scenes. He credited engineers and scientists for the success of the overall space program. Aldrin also urged everyone in the room to continue to dream beyond the Moon. But behind every dream, he said, lies the good work of engineers. Dr. Buzz Aldrin with a reprint of an article from Mechanical Engineering magazine. The crowd jumped to its feet at the sight of Aldrin and greeted him with a standing ovation. 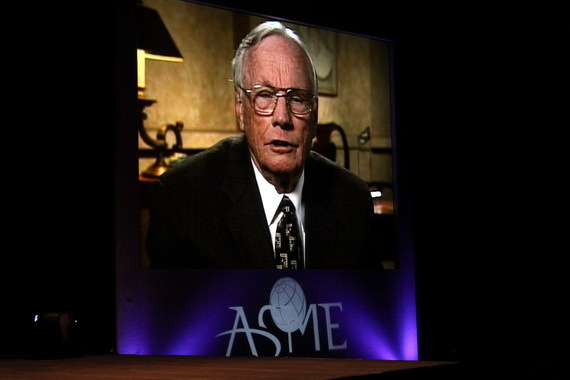 Dr. Neil Armstrong in a videotaped message. Neil Armstrong, and Michael Collins were unable to attend the ceremony, but Armstrong sent a videotaped acceptance. 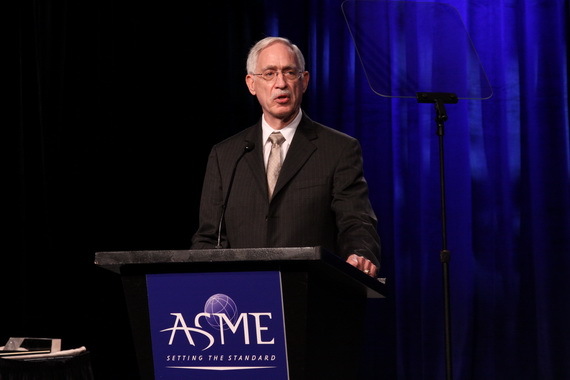 He thanked ASME and the Society’s president, Amos Holt, for the prestigious award and also spoke of the critical role engineers play in space exploration and in everyday life. Then Loughlin introduced ASME member and NASA Mission Specialist “Danny” Olivas who returned recently from space onboard the Space Shuttle Discovery. In a video message, Olivas, who called himself a “proud” ASME member since 1991, described his recent flight some 220 miles above the Earth. Among Discovery’s payload of laboratory and experimental equipment was an ASME patch created to commemorate his shuttle flight. The patch flew on the mission and returned to Earth with Olivas. T.K. 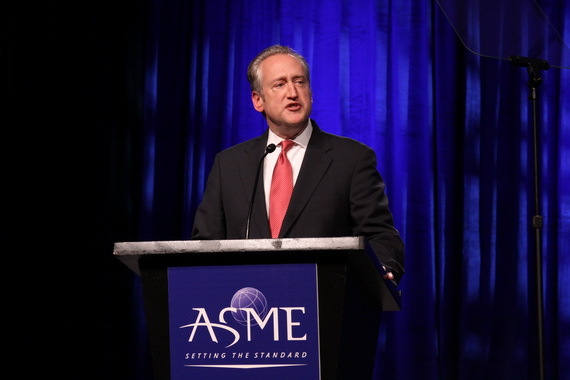 Mattingly then delivered a 50-minute keynote address emphasizing the importance of a systems engineering approach to solving technology problems. 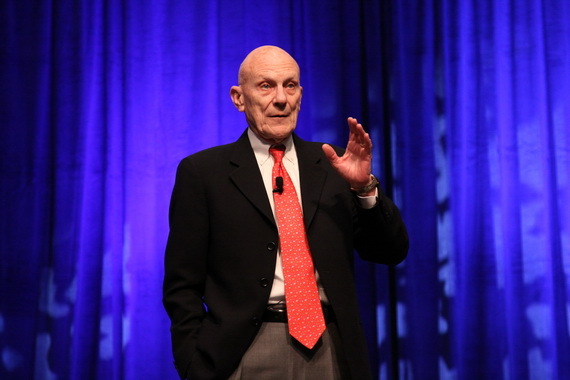 He kept the audience captivated by anecdotes related to the safe return of Apollo 13, after the ill-fated mission endangered the lives of the three crew members. Mattingly’s role in Apollo 13 was depicted in the movie of the same name. Mattingly later went to the Moon as part of Apollo 16. Nice photos from the keynote! That was a great event. Nice blog.. hope to see you more frequently here..